A very serious medical condition, Sleep Apnea can be dangerous if symptoms are ignored and the condition is left untreated. Loud snoring, gasping or choking during sleep, sleepiness during the day, dry mouth or sore throat upon waking, and other various symptoms may all be indications that your body actually stops breathing during the night. Although one of the most common treatment options for sleep apnea is a breathing machine, some people prefer to try alternative treatments for their condition. Depending on the cause of your sleep apnea, sleeping posture may significantly affect your body’s ability to breathe during sleep. Certain products used during sleep, such as mattresses and pillows, may provide just enough support to open up the breathing passages and allow the body to breathe regularly again during sleep. Sleep Apnea pillows on their own work well for those with a mild form of Obstructive Sleep Apnea (OSA), as well as for anyone who needs to make use of a CPAP breathing machine and are aiming to sleep comfortably with it. What is a Sleep Apnea Pillow? Sleeping flat on the back can be the most comfortable position for sleeping for many people. But sleeping on the back (supine position) can also cause the breathing passes to be shut, particularly if the fleshy part of the tongue falls into the back of the throat. Since sleeping posture so readily affects healthy breathing during sleep, changing the body’s posture with a sleep apnea pillow can decrease the number of sleep apnea events experienced during the night. People with severe sleep apnea probably will not benefit from a sleep apnea pillow, and their doctors will likely recommend a stronger treatment such as a CPAP breathing machine. Even people who need to use a CPAP breathing machine for sleep apnea can still benefit from the use of a special pillow. In fact, one of the objections that many people have against using a CPAP machine is that they can’t sleep very well when using one. A pillow specially designed for use with a CPAP machine can help people with the condition to sleep well even while using a breathing machine. What to Look for in a Sleep Apnea Pillow? When considering the purchase of a sleep apnea pillow, there are certain aspects to look for which will help you determine if a pillow is right for you. Support. Because people with sleep apnea need exceptional support of the head and neck, look for this aspect to keep the breathing passages open. Firmness. While a soft, cushy pillow might be your idea of comfortable, that isn’t going to help you with your sleep apnea. You need a firm pillow that will not lose its shape or collapse throughout the night. Down or synthetic polyester “fluffy” pillows are likely the worst type of pillow for you. A sleep apnea pillow should have a high firmness that will last all night long. That’s why memory foam pillows often work very well. Side-Sleeping. People who have sleep apnea need to aim toward sleeping on their sides if at all possible as it has been shown that side sleepers show much more improvement in their symptoms than back sleepers do. A firm pillow that allows you to sleep comfortably on your side (or stomach, if the side doesn’t work) will allow you the best results. CPAP Accommodation. If you do make use of a CPAP or other breathing machine, choose a pillow that offers channels and notches that allow the hose to be easily accommodated. This will keep your mask in place and allow you a more comfortable, deeper night’s sleep. Different types of sleep apnea pillows may offer you some relief from sleep apnea, depending on the severity of your condition and what positions you prefer for sleeping. The fancy term for this is “positional therapy”. Just limiting the amount of time you spend sleeping flat on your back can help reduce the number of sleep apnea events in people who have mild or moderate forms of sleep apnea. Certain pillows work well to prop up the head and neck in order to keep the soft tissues of the neck from slipping back into the breathing passages. Although back sleeping is not ideal for people with sleep apnea, this type of pillow allows you to get the rest you need on the back, without compromising your comfort. Another type of positional therapy is when a pillow encourages you to sleep on your side, maintaining openness in airways and allowing you to breathe easy while sleeping. For people who do use a CPAP machine, a side sleeping pillow allows the machine to deliver a lower level of pressure which offers a more restful night of sleep. These pillows are often available in different sizes to meet the needs of people with larger or smaller shoulder widths. They are typically firm in order to keep the head, neck, and spine supported. 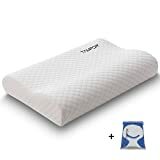 Some sleep apnea pillows are simply made with a memory foam contour design that allows the person to sleep on their side more comfortably, providing support to the head and neck. Side sleeping is recommended for those with sleep apnea, allowing the breathing passages to remain open and promoting healthier sleep patterns. 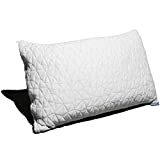 These types of contour pillows are not comfortable for those who are stomach sleepers, but may be used to lift the head to make breathing more comfortable for those who prefer to sleep on their backs. Many of these contour pillows are basic and don’t provide channels or notches for the hoses of CPAP masks to fit into very well. Many people who sleep with memory foam and/or CPAP pillows find that they get very hot during the night and this can make sleeping difficult. (This may particularly true anyway for people who struggle with sleep apnea due to excess weight or women who are in their 40s and 50s, dealing with hormonal hot flashes.) 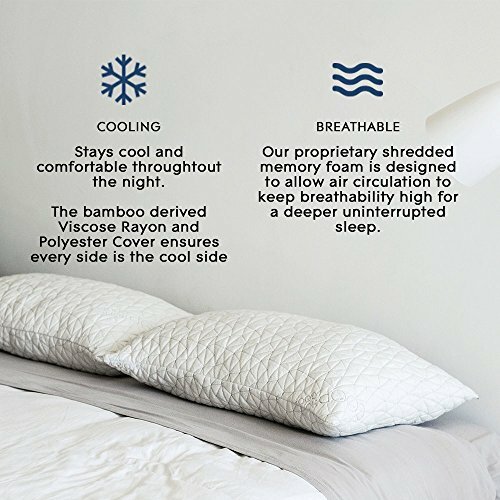 This style of pillow offers a cooling gel section to lay your head on, layered on top of memory foam that contours well to the head and neck while supplying support to the spine. 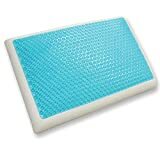 Other cooling memory foam pillows infuse the cooling gel into the middle of the memory foam. The neck and the head stay well-supported which can help to avoid snoring and apnea events, and the cooling gel allows the body to remain at a comfortable temperature throughout the night. Sleep Apnea pillows are a great way to open up the breathing passages and make your sleep safer and more comfortable, with or without a breathing machine. Because this is often a new type of pillow, it’s important not to give up after one night but give it a chance for a week or two in order to find the best possible positioning for your new sleep apnea pillow.